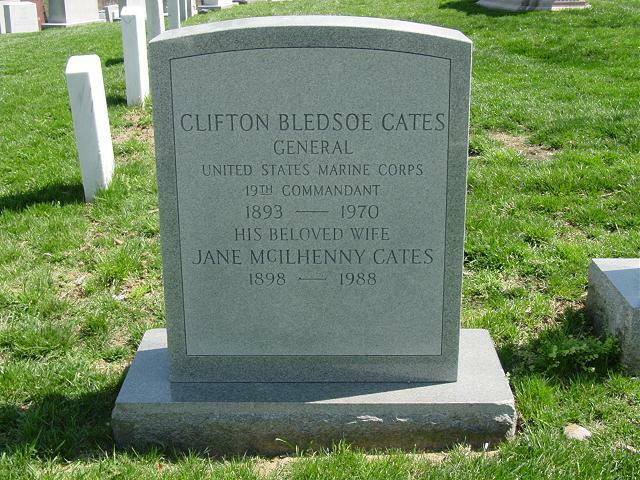 General Clifton Bledsoe Cates, 76, nineteenth Commandant of the Marine Corps, died June 4, 1970, at the U. S. Naval Hospital, Annapolis, Maryland, after a long illness. He was buried with full military honors, June 8, 1970, at Arlington National Cemetery. 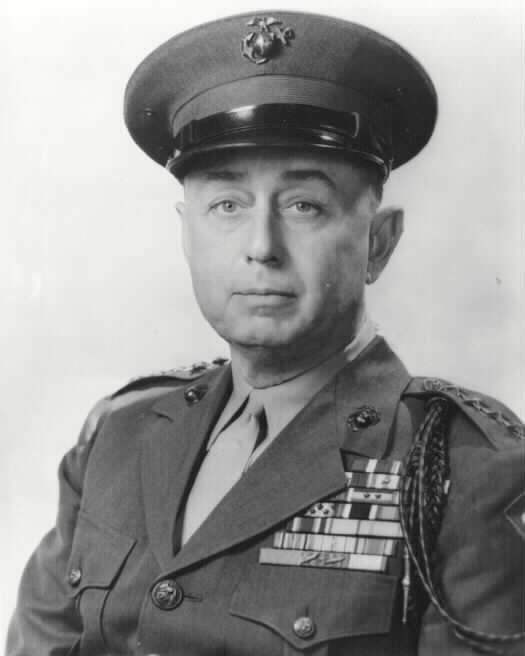 One of the few officers of any service who had commanded a platoon, a company, a battalion, a regiment and a division under fire, he served as the 19th Commandant of the Marine Corps from January, 1948, until January, 1952. He retired on June 30, 1954, after two and a half years as Commandant of the Marine Corps Schools at Quantico, Virginia. A varsity man on both the baseball and football teams at the University of Tennessee, where he studied law, the future Marine general soon after graduation plunged into a career that took him through five major engagements in the first World War and another five in the second. His service ranged from duty at sea to duty at the White House; from platoon leader to Commandant. During more than 37 years as a Marine, he was wounded several times and won nearly 30 decorations. "A bold tactician, he landed his force on the southeast shore of the island against heavy enemy resistance and, defying the terrific, continuous bombardment laid down by enemy guns located strategically on high ground which afforded direct observation and complete coverage of his entire zone of action, pushed his relentless advance...through the shifting volcanic sands. "Repeatedly disregarding his own personal safety, (then) Major General Cates traversed his own front lines daily to rally his tired, depleted units and by his undaunted valor, tenacious perseverance, and staunch leadership in the face of overwhelming odds, constantly inspired his stouthearted Marines to heroic effort during critical phases of the campaign." As a young lieutenant with the 6th Marine Regiment in World War I, the general fought in the Verdun defensive sector, at Bouresches and Belleau Wood in the Aisne defensive, at Soissons in the Aisne-Marne offensive, in the Marbache sector of the St. Mihiel offensive and in the Blanc Mont and Argonne-Forest engagements of the Meuse-Argonne offensive. He won the Navy Cross, Army Distinguished Service Cross and an Oak Leaf Cluster in lieu of a second Distinguished Service Cross for heroism in the Bouresches and Belleau Wood fighting, where he was both gassed and wounded. He won the Silver Star Medal at Soissons, where he was wounded a second time, and an Oak Leaf Cluster in lieu of a second Silver Star Medal in the Blanc Mont fighting. Apart from those decorations and the Purple Heart Medal with Oak Leaf Cluster, which he received for wounds, the French Government recognized his heroism with the Legion of Honor and the Crois de Guerre with Gilt Star and two palms. He also was cited twice in the general orders of the 2nd Division, AEF, and once by the Commanding General, AEF, and is entitled to wear the Fourragere awarded the 6th Marines. General Cates was born on August 31, 1893, at Tiptonville, Tenn. After elementary education in county schools, he was sent to the Missouri Military Academy, where he became an honor student and a four-letter man in sports. His Bachelor of Laws degree was obtained at the University of Tennessee in 1916. On June 13, 1917, as a 2d lieutenant in the reserves, he reported for active duty at the Marine Barracks, Port Royal, S. C., and sailed for France the following January. After participating in the occupation of Germany, General Cates returned to the United States in September, 1919, and during the next year he served in Washington, D. C., as a White House Aide and Aide-de-Camp to the Commandant of the Marine Corps. He then served at San Francisco, Calif., as Aide-de-Camp to the Commanding General, Department of the Pacific, from October, 1920, until June, 1923, when he began a tour of sea duty as commander of the Marine Detachment aboard the USS CALIFORNIA. That assignment was completed in April, 1925. A month later he began a year of service with the 4th Marine Regiment at San Diego, Calif. In March, 1928, after serving on recruiting duty at Spokane, Wash., and Omaha, Neb., the General was named a member of the American Battle Monuments Commission at Washington. He served in that capacity until May, 1929, then was ordered to Shanghai, China, where he joined the 4th Marines. Three years later he was detached from that regiment to return to Washington for study in the Army Industrial College. Completing his course in June of 1933, General Cates reported the following month to Quantico, where he served with the 7th Marines and completed the Senior Course in the Marine Corps Schools. He returned again to Washington in September, 1935, and was assigned to the War Plans Section of the Division of Operations and Training at Marine Corps Headquarters. In August, 1937, the general sailed for Shanghai as a battalion commander with the 6th Marine Regiment, serving with that unit until he joined the 4th Marines in March, 1938. Again the following year he was brought back to Washington for instruction in the Army War College. That course was completed in June, 1940, and he reported the next month to the Philadelphia Navy Yard as director of the Marine officers Basic School. By the time the United States entered World War II, the future Commandant was a Colonel. In May of 1942, General Cates took command of the 1st Marine Regiment, which, as part of the 1st Marine Division, he led at Guadalcanal. With the invaluable experience obtained in that campaign, he was returned to the United States the following March for his first tour of duty as Commandant of the Marine Corps Schools at Quantico. He continued in that capacity until June, 1944. The following month he took command of the 4th Marine Division, leading that organization in the Pacific theater until the end of the war. By that time he was a Major General. Ordered back to the United States in December of 1945, the General became President of the Marine Corps Equipment Board at Quantico, holding that position for six months before he was named Commanding General of the Marine Barracks, Quantico. He held that command until January 1, 1948, when he was advanced to the rank of General and sworn in as Commandant of the Marine Corps, succeeding General Alexander A. Vandegrift. When he completed his four-year term as Commandant, he reverted to the rank of lieutenant general and began his second tour as Commandant of the Marine Corps Schools. He was again promoted to general upon retirement. In addition to the decorations already mentioned, General Cates' medals and decorations include the Presidential Unit Citation ribbon with three bronze stars (Guadalcanal, Tinian and Iwo Jima); the World War I Victory Medal with Aisne, Aisne-Marne, St. Mihiel, Meuse-Argonne and Defensive Sector clasps; the Army of Occupation of Germany Medal; the Expeditionary Medal (China-1929-31); the Yangtze Service Medal (Shanghai-1930-31); the China Service Medal (China-1937-39); the American Defense Service Medal; the Asiatic-Pacific Area Campaign Medal with one silver star in lieu of five bronze stars; the American Area Campaign Medal; the World War II Victory Medal; the National Defense Service Medal and the Netherlands Order of the Orange Nassau with crossed swords and rank of Grand Officer. He also held LL.D. degrees from the University of Tennessee and the University of Chattanooga. The Navy Cross is awarded to First Lieutenant Clifton B. Cates, United States Marine Corps. While advancing with his company on the town of Bouresche, their progress was greatly hindered by withering machine-gun and artillery fire of the enemy, which caused many casualties, one of whom was his commanding officer. Taking command, Lieutenant Cates led them on to the objective, despite the fact that he was rendered temporarily unconscious by a bullet striking his helmet and that this was his first engagement. Exposing himself to extreme hazard, he reorganized his position with but a handful of men. The Distinguished Service Cross is presented to Captain Clifton B. Cates, U.S. Marine Corps, for extraordinary heroism in action near Bois de Belleau, France, June 13 - 14, 1918. During the night, a severe gas attack made it necessary to evacuate practically the entire personnel of two companies, including officers. Captain Gates, suffering painfully from wounds, refused evacuation remaining and rendering valuable assistance to another company. Biography courtesy of the United States Marine Corps.